Here are the latest details from some agreed-upon contracts during the second wave of free agency. All links courtesy of the Houston Chronicle’s Aaron Wilson, unless otherwise noted. Mark Ingram, RB (Ravens): Three years, $15MM. $6.5MM guaranteed. $4MM signing bonus. $500K of $4MM 2020 base salary is guaranteed, per Wilson (on Twitter). Terrell Suggs, LB (Cardinals): One year, $10MM. $7MM guaranteed. $4MM signing bonus. $3MM 2019 base salary (link). Donte Moncrief, WR (Steelers): Two years, $9MM. $3.5MM signing bonus. $5MM due in 2019, per Tom Pelissero of NFL.com (on Twitter). J.R. Sweezy, G (Cardinals): Two years, $9MM. $3MM signing bonus. $1.5MM 2019 base salary; $3.5MM 2020 base (link). Jake Ryan, LB (Jaguars): Two years, $8MM. $1MM guaranteed. $500K signing bonus. Non-guaranteed $5.5MM option due on the 22nd day of the 2020 league year (link). Adarius Taylor, LB (Browns): Two years, $5MM. $1MM signing bonus (link). Mychal Kendricks, LB (Seahawks): One year, $4.5MM. $2MM base salary. $250K training camp bonus. $250K bonus for being on Seattle’s 53-man roster in Week 1. $1MM in incentives (playing time, sacks), Wilson tweets. Shaquil Barrett, LB (Buccaneers): One year, $4MM. $3MM guaranteed. $1MM in incentives for playing time, sacks (link). Tyler Eifert, TE (Bengals): One year, $4MM. $1.2MM signing bonus. $1MM base salary; $2.5MM incentives related to catches, yards and touchdowns (Twitter link). Dwayne Harris, WR (Raiders): One year, $1.6MM. $275K signing bonus. $400K incentive based on return average (link). Kevin White, WR (Cardinals): One year, $1.5MM. $400K signing bonus. Max value: $2.5MM, per Pelissero (on Twitter). Dan Bailey, K (Vikings): One year, $1MM. $250K guaranteed. $1MM incentive based on field goal success rate (link). Cedric Ogbuehi, T (Jaguars): One year, $895K. $90K signing bonus (link). Antone Exum, S (49ers): One year, $855K. $50K signing bonus (link). Eli Rogers, WR (Steelers): Rogers’ 2018 contract tolled; he is due $720K in 2019 (link). 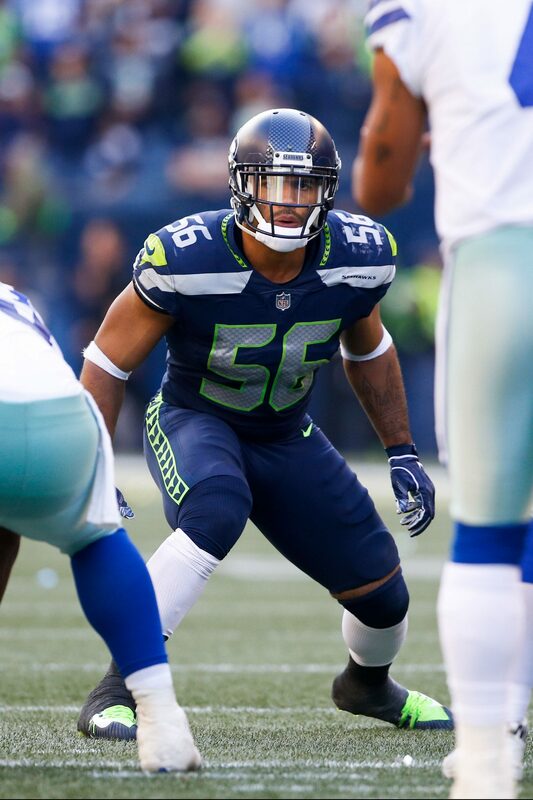 The Seahawks have re-signed linebacker Mychal Kendricks, according to Tom Pelissero of NFL.com (Twitter link). It’s a one-year, $4MM deal, tweets Mike Garfolo of NFL.com. Kendricks, of course, was arrested for insider trading last year and will face sentencing next month. Previously, head coach Pete Carroll indicated that he would like Kendricks back in 2019, provided that a prison sentence did not interfere with his availability. Kendricks could be facing 30-to-37 months in prison, so there’s no way of knowing whether he’ll be able to play football again anytime soon. If he is imprisoned for 37 months, he’ll be 31 years old at the time of his release and three years removed from the game. Kendricks made his Seahawks debut — following a post-arrest release from the Browns — in Week 2 against the Bears, but after some back-and-forth with the league, he was hit with an eight-game suspension in October. His 2018 season ended with 20 tackles and two sacks over the course of four games. Seattle could potentially lose fellow linebacker K.J. Wright to free agency, so Kendricks could help fill at the second level, provided he’s allowed to play. Mychal Kendricks‘ sentencing date for his insider trading case has been moved from Jan. 25 to April 4, according to a spokesperson for the U.S. District court in Pennsylvania handling the case (Twitter link via ESPN.com’s Brady Henderson). It’s a development that could impact Kendricks’ football future. Of course, the later sentencing date further complicates matters. Kendricks will not realistically be able to sign a contract with a team or gear up for the 2019 season while his freedom hangs in the balance. In a best case scenario, Kendricks can hope for a slap on the wrist and the ability to market himself in the second wave of free agency. The Saints cut Brandon Marshall on Wednesday, but head coach Sean Payton says New Orleans could still re-sign the veteran wideout, tweets Nick Underhill of the Advocate. Marshall, 34, has miraculously never made a postseason appearance during 13-year NFL career, but that could change if he ends up back with the Saints. Meanwhile, another mid-30s pass-catcher might be close to returning to the field in New Orleans, as Payton told reporters Ted Ginn Jr. could be nearing activation. Ginn, who underwent knee surgery in October, is reportedly one of two candidates under consideration to be activated from the Saints’ injured reserve list, the other being offensive lineman Josh LeRibeus. The Seahawks will likely have interest in re-signing linebacker Mychal Kendricks after he serves a sentence for insider trading, according to Brady Henderson of ESPN.com (Twitter link). “He wants to be part of this thing so badly, but he doesn’t get to this time around,” head coach Pete Carroll said of Kendricks after the latter was placed on injured reserve earlier this week. “We’ll look forward to getting him back next time and keep him with us.” Kendricks will face sentencing in January, but as Henderson notes, Carroll’s comments could be an indication Seattle doesn’t expect Kendricks to serve a lengthy term. Technically, Kendricks could be facing 30-to-37 months in prison. Ezekiel Ansah has likely played his final down for the Lions after going on IR Tuesday, writes Michael Rothstein of ESPN.com. Ansah, 29, played the 2018 campaign under a one-year, $17.1MM franchise tag, but it’s extremely unlikely Detroit will use that tender again next season. While he’s historically been limited by nagging injuries, Ansah typically didn’t miss many games until this year, when he’s only managed seven appearances. Ansah may need to take a one-year, pillow contract in 2019 to re-establish his value, but it doesn’t seem like that deal will come from the Lions. The 49ers are already armed with the eighth-most projected cap space in 2019, and they could create even more by parting ways with several veterans this offseason, per Matt Barrows of The Athletic. Sunday was a pointed example of exactly which aged players could be on the chopping block: wideout Pierre Garcon missed a fourth consecutive game with injury, while linebacker Malcolm Smith and defensive tackle Earl Mitchell saw their snaps either reduced or eliminated altogether. With their quarterback of the future already locked into a long-term deal, San Francisco could spend the upcoming offseason re-tooling other parts of its roster. Mychal Kendricks‘ tumultuous season will end on a down note. 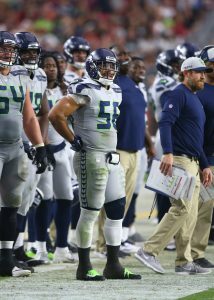 The Seahawks linebacker suffered a broken tibia on Monday night and will miss the rest of the season, sources tell ESPN.com’s Adam Schefter (Twitter link). Kendricks will be placed on injured reserve this week, opening up a spot on the 53-man roster. Kendricks, of course, has bigger things to worry about than football. After pleading guilty to federal insider trading charges, Kendricks will face sentencing in January. He faces between 30 and 37 months in prison, meaning that Monday night’s game could mark his last in the NFL. If he is imprisoned for the full 37 months, he’ll be 31 years old at the time of his release and three years removed from the game. Kendricks made his Seahawks debut in Week 2 against the Bears, but after some back-and-forth with the league, he was hit with an eight-game suspension in October. His 2018 season ends with 20 tackles and two sacks over the course of four games. The loss of Kendricks stings for Seattle as they’ll have a thinner group of LBs to draw from in the playoffs. Moving forward, they project to start Barkevious Mingo, Bobby Wagner, and K.J. Wright, assuming that Wright’s knee is stable enough to play. Late round rookies Jake Martin and Shaquem Griffin are also on hand to sub in at outside linebacker and Villanova product Austin Calitro can contribute in the middle. Mychal Kendricks‘ suspension is over, and he is back on the Seahawks’ active roster. The team activated the embattled linebacker on Monday, Bob Condotta of the Seattle Times tweets. The Seahawks waived linebacker Emmanuel Ellerbee to make room on the 53-man roster. Kendricks played in three games for the Seahawks earlier this season before serving an eight-game suspension. Having pleaded guilty to federal insider trading charges, on which he is awaiting sentencing in January, Kendricks stands to return to game action Sunday. He registered two sacks and 15 tackles for the Seahawks during his brief game stint in September. The former Eagles starter (and brief Browns employee) made two starts with Seattle. When Kendricks was suspended, the Seahawks were viewed as a rebuilding team that was not especially likely to return to the playoffs. Now, Kendricks will stand to help a team that is contenting for its sixth postseason berth in seven years. However, the outside linebacker faces between 30 and 37 months in prison at the January 24 sentencing. So, it’s quite possible these upcoming Seahawks games will be the last of the 28-year-old defender’s career. The NFL suspended linebacker Mychal Kendricks for eight games, according to Mike Florio of PFT (on Twitter). The Seahawks defender will be credited for the three games served under his previous “indefinite” suspension, making him eligible to practice with the club in Week 12. Kendricks’ first game back is slated to come on Monday, Dec. 10 when the Seahawks host the Vikings. In theory, Kendricks could appeal, but he might just accept his punishment since it’s more lenient than expected. The league seemed determined to keep him off of the field until his insider trading case was settled in court, but he will instead be allowed to return to action for the Seahawks’ playoff push. At 4-3, the Seahawks have an uphill battle in trying to beat out the Rams for the NFC West crown. However, they’re very much in Wild Card contention, and Kendricks can be a game-changer if they’re still afloat in December. Kendricks was playing well in his brief time as a Seahawk, posting 15 tackles and two sacks in three games with the club. Rumors of clashing egos within the Browns’ coaching staff have been swirling ever since HBO cameras picked up some internal disagreements on Hard Knocks, and coach Hue Jackson recently added fuel to the fire. After a pair of disappointing Browns losses, Jackson hinted he was going to take back more control of the offense, seemingly taking shots at offensive coordinator Todd Haley in the process. But Haley is pushing back on reports of a feud, saying he and Jackson are on the “same page”, according to Pat McManamon of ESPN. It’s highly possible, if not likely, that Haley is just saying that to the media and that there actually is bad blood behind the scenes. Haley and Jackson have never seemed like a perfect match for the Browns, and tensions are high with everyone’s jobs in danger. Jackson is backing off his initial comments and expressing more confidence in Haley, McManamon writes, but it will still be something to monitor going forward, and firings could be imminent. In addition to working out former Raiders second round pick Obi Melifonwu today, the Patriots also had a pair of other players in for tryouts. They had “TE Ben Koyack (Notre Dame), S Dexter McCoil (Tulsa) in for free-agent workouts today”, according to Mike Reiss of ESPN (Twitter link). Koyack has been with the Jaguars the past few years, and caught the game winning touchdown in Jacksonville’s first playoff game last year. 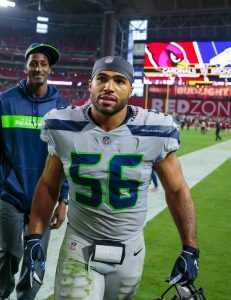 Seahawks linebacker Mychal Kendricks has been suspended indefinitely by the league, and while he’s working to negotiate an agreement with the league office, there’s still no word on when he’ll be able to return. Coach Peter Carroll “says he has been in communication” with the league and while there’s been no “definitive word” they’re “hoping for more clarity early next week”, according to Bob Condotta of The Athletic (Twitter link). Kendricks was suspended due to being charged with insider trading, which led to his release from the Browns earlier this year. Damon Harrison was traded from the Giants to the Lions earlier this week, and now we have more details on the trade. It was reported that Harrison was traded for a fifth round pick, but that pick is apparently conditional, according to veteran NFL reporter Howard Balzer (Twitter link). Balzer doesn’t state what the conditions are, but it’s fair to assume they’re related to snaps or games played. Seahawks linebacker Mychal Kendricks, who was suspended indefinitely earlier this month, will meet with the league office sometime this week to discuss his ban, per Mike Florio of Pro Football Talk. Kendricks’ suspension, of course, stems from his involvement in insider trading, to which he has pleaded guilty. He will be sentenced in January 2019 and could receive 30 to 37 months in prison. As a result, Kendricks, his lawyers, and the NFLPA have been battling to prove that the NFL does not have the right to impose an indefinite suspension under these circumstances. Although the indefinite suspension was upheld on appeal, arbitrator Harold Henderson’s written ruling suggested that a more specific punishment should be forthcoming. Some sources familiar with the situation, however, believe the league wants to postpone such a decision until after Kendricks is sentenced. Florio opines that the NFL should impose a suspension of a fixed number of games and should do it quickly out of fairness to Kendricks. He adds that, since the standard punishment for first-time domestic violence offenders is a six-game suspension, Kendricks should be banned for at most four games, and Florio says there is no good reason a decision in that regard has not been made already. Kendricks’ suspension has forced him to miss Seattle’s last two contests, though the team is on a bye this week. He was playing well in his brief time as a Seahawk, posting 15 tackles and two sacks in three games with the club. Seattle, at 3-3, would certainly like to have him back soon, and Kendricks — who may be 31 when he is released from prison — is obviously anxious to get back on the field while he still can.